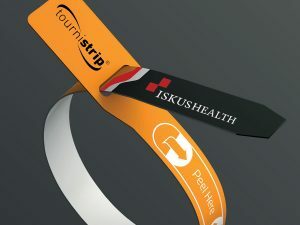 Developed in the United Kingdom by doctors and is the only truly single patient use tourniquet available today. It has gained much praise in the medical innovation press for its sustainable design that helps meet the standards of ANTT® in IV access procedures today. Tournistrip® single use Tourniquet looks and operates like a conventional tourniquet, but Its unique design and construction means the tourniquet is truly single use, and it cannot be re-used. It is easy to tension and adjust and can be repositioned on the same patient multiple times. Removal is single-handed, and unlike like some ‘rubber band’ designs will not pinch the patients skin, thus improving patient comfort. 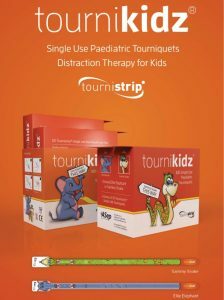 Tournikidz has the same benefits as Tournistrip; It is truly single use, it is adjustable and more comfortable for the young patient compared to the ‘rubber band’ designs available elsewhere. The dispenser adopts the same aseptic technique approach, with refills minimising cost, waste and environmental impact.